The award winner will receive €500 towards the cost of training or an international visit, as well as an award plaque, farm video, and opportunity to participate in a European new entrant conference with other award winners. Working without fertilisers or pesticides, The Horned Beef Company Ltd farms over 500 acres in the Lake District. 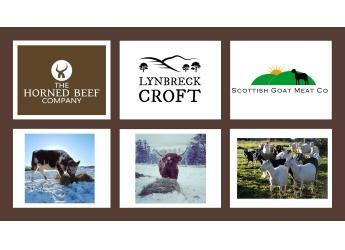 Lynbreck Croft is a 150-acre mixed habitat croft enterprise located in the Cairngorms National Park, and the Banffshire-based Scottish Goat Meat Company provides high-quality, locally reared goat meat direct to customers’ doors. Simon Gadd, chairman of the NFU's Next Generation Forum and member of the project’s national steering group, stated: “The high calibre of the applicants makes the job of choosing a winner very difficult. The award was offered this autumn to farmers, crofters and small-holders across the UK. The European Commission-funded NEWBIE project (New Entrant netWork: Business models for Innovation, entrepreneurship and resilience in European agriculture) is offering the award to new entrants in 8 European countries. It is part of a suite of opportunities aiming to help new entrants network and develop successful businesses. Dr Lee-Ann Sutherland, a research leader in the James Hutton Institute’s Social, Economic and Geographical Sciences group in Aberdeen and UK NEWBIE coordinator, added: “Each farm shortlisted represents a stellar example of how new entrants innovate to deal with the common hurdles of starting a new farm business. National Farmers Union representatives from England, Scotland, Northern Ireland and Wales will select the winner. The award will be announced in early May. Similar awards are being offered across Europe by NEWBIE project partners. Award winners from partnering European countries will be encouraged to share their experiences through international exchange opportunities provided by the NEWBIE project.